Purposeful Pathway: Where Faith and Business Intertwine! Looking for more Joy in Your Journey? 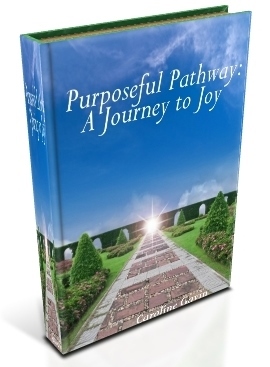 Sign up for the free e~book Purposeful Pathway: A Journey to Joy in the form on the right side of this page.The workbook is rich with Scriptural insights, poetic inspirations and practical step-by-step directions for journeying with more joy. Refresh with Christian poetry and gain practical yet inspirational guidance with Purposeful Pathway Biz Tips on the Blog page. Learn about Christian Business Programs to infuse your business – and your life – with more purpose, passion and prosperity. I help faith-based entrepreneurs attract ideal clients, powerfully package services and systematize efforts so they can enjoy fun, fruitful and profitable businesses! Contact me directly (caroline@purposefulpathway.com) with questions or to set up a complimentary Purposeful Pathway Business Coaching Consultation. From this free consultation, you will gain clarity about your biggest challenges, renewed energy to overcome them and a customized written action plan. Join the journey each week on Purposeful Pathway Radio; listen to other Christian entrepreneurs as they share insights for business and for life at www.PurposefulPathwayRadio.com. Sign up for the 21-Day Attract Clients NOW Challenge directly below. Are you a faith-based entrepreneur desiring to change the world for good with the gifts God has given you? Take the next step by signing up for the free 21-Day Attract Clients Now video series; simply enter your name and email address above. Caroline Gavin is a Heart-Centered Business Coach, Speaker, Author of several books and host of Purposeful Pathway Radio. As a Heart-Centered Business Coach and the Founder of Purposeful Pathway, she helps heart-centered entrepreneurs pave their vocational paths, live with purpose and walk with God’s way. With years of experience in the financial and real estate industries, Caroline blends her passion for God, her financial expertise and her business acumen to create phenomenal results for her clients. Thank you for traveling this Purposeful Pathway with me! What a blessing and an encouragement to read! Praise the Lord for His gracious hand, for working through His children as vessels of love. May the Holy Spirit abound in your heart to full measure, and I thank God I am your eternal sister in Christ. I appreciate your sharing your heart! God bless you and your heart for Him, Joel! Thank YOU for sharing from your heart, and may the Lord’s graces continue to abound to you! Yes, Lord Jesus, awaken our hearts in Your Precious Love! Amen! The page Mirrors the Woman Designer who was as is guided by the Holy Spirit in your strengthening sanctification and Joy in your productiveness. You may call it work, I call it art, when I read words that spring from you, from within your heart. David, once again you tremendously bless my heart with the words of wisdom and encouragement you share! Surely God’s Spirit shines in and through you! May the riches of eternal peace, love and joy abound in your heart and in your days. Grateful I am for you, dear brother and friend, always! Grateful to praise the Lord with you, dear Pastor! Praying for you and your ministry! Yes, praise The Lord! I am praying for you and your wonderful ministry, dear Reverend John David! May the Lord’s love, peace, light, joy and inspiration abound to you! Dear Benefactress Caroline Gavin,CHRIST YESTERDAY,TODAY AND FOREVER. Thank you very much for this spiritual project,which leads many souls to heaven after reading seven steps of PURPOSEFUL PATHWAY,GOD BLESS.Frankly speaking I admire and appreciate your efforts and of your fellows whom you consolidate with to bring out this heavenly TREASURE and your TOTAL DEDICATION OF YOUR LIVES COMPLETELY TO GOD.Really this project needs a lot of sacrifice and we can say this it is a MARTYRDOM of its own kind.Today is a feast of Saints Pontianus,Pope and Hippolytus,Priest,MARTYRS. Blessed indeed is our church,honoured and glorified by God,and in our days gaining glory in blood of the martyrs.The church in former times shone white with the good works of the brethren;now it shines red with the blood of martyrs.From its flowers neither lilies nor roses are lacking.Let each and everyone strive to attain the high worth of either glory:THE WHITE GARLANDS OF GOOD WORKS OR THE ROSE-RED CROWNS OF MARTYRDOM. St.John Bosco said that only God knows the good that can come about by reading one good Catholic book. Saint Jerome says that when we pray we speak to God but when we read God speaks to us.St.Augustine,Saint Ignatius of Loyola,and saint John colombino all left world and dedicated their lives completely to God,after reading a good spiritual book. I am fully convinced some people who will visit this website may dedicate their lives or develop a deeper love for Him ad His Mother.Through your generosity and sacrifice,God will accomplish this. God reward all of you abundantly. Your messages and photos continue to bring such joy to my heart! You speak words of wisdom inspired by the Holy Spirit! Thank you for living a life surrendered to the Spirit; thank you for following our Father’s lead; thank you for journeying faithfully in Jesus! Heartfelt thanks also for your tremendous encouragement regarding my ministry! Please know your encouraging messages are priceless to me! God is working through you to bless my heart, and I am grateful to read He is working through me to bless yours! May our Beloved Lord richly bless you, your parishioners, your ministry and your heart! May His joy, love, peace, hope, and inspiration continually pave every step of your pathway…as you follow His Purposeful Pathway! Once again thank for a good poem of ‘YOU AMAZE ALWAYS’.It is true that JESUS IS OUR TRUE CELEBRATION.On this perspective saint Maximilian Mary Kolbe,offered his life for the sake of others as a result in honored as a Martyr of love.’Just as Christ laid down his life for us,so should we lay our lives for our brothers.Saint Maximilian Mary Kolbe,understood this and acted accordingly.His self-sacrifice was similar in kind to that he received in concentrated camp.He loved Christ in his life and imitated him in death. Brethren,let us imitate Maximilian if we truly love Christ.We cannot show a better proof of our love than by imitating him. Christ humbled himself;the Christian has his example to imitate.’Precious in the sight of the Lord is the death of his saints’. with lots of love,Prayers and Priestly blessings. Once again you encourage my heart with words of wisdom and love! Jesus Christ is indeed our Celebration, and we experience true celebration when we surrender completely to Him! May we learn from saint Maximilian Mary Kolbe to sacrifice fully and joyfully; therein we find freedom, joy and peace. For therein we find union with God’s perfect will. Poetically and perfectly expressed: “Indeed the garden of the Lord contain not only the roses of martyrdom but also lilies of virginity ,the ivy of marriage,and violets of widowhood.” The garden of the Lord is resplendent with color, and may we bloom fully and fragrantly as the particular flowers He created us to be! Dear Benefactress and Cherished Sister Caroline Gavin,CHRIST IS THE LIGHT OF THE WORLD. Many Thanks for a poem of ‘HEALING HOPE.’I will comfort every soul I may meet with a comfort you give me pure and sweet,frankly speaking you are right.JESUS IS GOD-MAN.When God loves ,he wishes only to be loved in return;assuredly he loves for no other purpose than to be loved.He knows that those who love him are happy in their love. The Bridegroom’s love ,that Bridegroom who is love himself love,seeks reciprocal love and loyalty.She who is loved may well love in return. Thank you for being ‘THE LIVING INSTRUMENT OT THE MISSION OF THE CHURCH and GOD’S AGENT(to bring Good News of Salvation to everyone in our lives) through PURPOSEFUL PATHWAY.It is love of God and neighbor which brings people to Christ and his church.This duty and privilege is to all Catholics.Every person is unique in the plan of God as a result everybody is essential to God’s work among his people. May God reward you abundantly and bless works of your hands. Saint Rose of Lima,Virgin,pray for us(She made a great progress in a life of penance and mystical contemplation). Once again your messages and photos bring pure JOY to my heart! All PRAISE be to JESUS, the Source of divine comfort! Amen and Hallelujah! You, my cherished brother in Christ, shine with such a radiant love and light for Him! You are a precious and powerful INSTRUMENT for the LIVING GOD, as you have surrendered your heart to His will. Truly you travel the “Purposeful Pathway” — and you encourage so many to do the same! The Gospel radiates not only from your words but also in your life! I am lifting you, your precious ministry, your beautiful parishioners and your wonderful heart in prayer! May the Lord richly bless your heart for Him! How thankful I am to travel this precious pathway with you. Dear Benefactress and Cherished Sister in Christ Caroline Gavin,CHRIST IS THE LIGHT OF THE WORLD. Many thanks for a poem of ‘SEEK AND FIND’.Prayers needs perseverance and our Good Lord,grant us our petitions as He wants according to our spiritual and bodily needs and advantages. Let us have in mind the following word:PUSH. I wish a good preparation for 21st Sunday of the Year C of liturgical calendar. God reward you abundantly and bless works of your hands. Saint Bartholomew Apostle,Pray for us. My heart smiles when I read your messages, as they are rich with the Lord’s love and wisdom! All PRAISE be to JESUS! YES! May we “P.U.S.H” by asking, seeking and knocking with prayerful persistence! Our Father is faithful to give what is best according to His perfect and holy will. May our Beloved Lord Jesus richly bless you as you travel purposefully on His Pathway! Surely this is a journey to JOY. And BLESSED I am to walk it with you — as we walk with HIM! With lots of love, prayers and blessings…always!